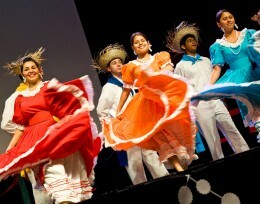 Latin Night will feature traditional Hispanic music and dancing. If everyone seems to be dancing the merengue on the way to class this week, it might be because Wright State University is kicking off its celebration of National Hispanic Heritage Month. Throughout the month, events such as dance lessons, film screenings and lectures will take place across campus. Gabriela Pickett follows the tradition of some of Mexico’s greatest artists, reacting to current world issues in a satirical and sometimes dark way. As an activist, Pickett uses her art as a venue for social commentary. Her landscapes are memories of her childhood recorded for posterity. As urbanization takes over the global landscape, Pickett wants to show the world’s beauty before it is transformed forever. Student Union Art Gallery hours: Monday–Saturday, 8 a.m.–10 p.m.; Sunday, 10 a.m.–10 p.m. Experience Latino music, salsa and merengue lessons, games, cultural booths, vendors, arts, crafts and much more! EL SUPER is a comedy-drama film based on a stage play by Iván Acosta. The film is a look at life in the United States from the perspective of frustrated Cuban exiles. What is a Latino/Latina identity? Is Latino/Latina identity a racial identity, ethnic identity, both or neither? Dr. Ernesto Velasquez, assistant professor of philosophy, University of Dayton, will talk about a few ways this question has been addressed and why it matters. Join us for an evening of fellowship with beautiful Latino music, and salsa and merengue lessons.